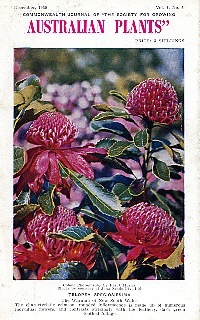 The Society's main publication is the journal Australian Plants which is issued 4 times per year. The journal is published by our New South Wales branch and was first issued in 1959 under the editorship of the late Bill Payne, who remained as editor for over 40 years. Australian Plants attempts to strike a balance between articles of practical interest to the average grower and scientific research papers. The journal has built up a high reputation since its first issue and is held in many libraries both in Australia and overseas. It's authors include the foremost experts in research into the horticulture and botany of Australian native plants as well as experienced amateur growers. Australian Plants is illustrated with numerous colour photographs and line drawings. It's topics cover a wide range and include landscaping, growing, botany, propagation and conservation. In December 2009, Australian Plants celebrated 50 years of publication! Australian Plants is a 48 page publication in A5 format. The contents of the most recent issues are available here. Indexes to 'Australian Plants' from Volume 1 onwards can be downloaded as PDF files from our Downloads page. The full issue of Vol.1 No.1 can be also be downloaded from our Downloads page. the opportunity to meet like minded people. It is also possible to subscribe to Australian Plants independently of Society membership via online subscription through the Australian Plants Society (NSW) website. A checklist of most of these publications (but, almost certainly, not all!) was published in 2007 to mark the 50th anniversary of the Society for Growing Australian Plants, as the Society was known originally. 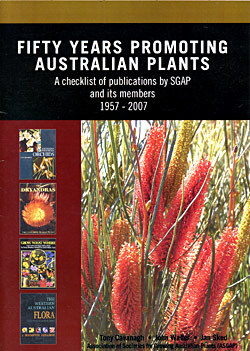 The checklist - "Fifty Years of Promoting Australian Plants" - is available for download. Titles that have been published by the Society itself or in collaboration with commercial publishers include the following. Many are now out of print but may be available through municipal libraries. Some more recent titles may be available though regional and some district groups or through commercial booksellers. Please note that ANPSA does not have a service for direct sales of publications. Adnyamathanha and Beyond - Useful plants of an Ancient Land by Neville Bonney (2007), published by the Australian Plants Society (South Australia). Further details and a review are available here. Australian Brachyscomes by the ANPSA's Australian Daisy Study Group (1995). This book documents 74 species, a number of varieties, distinctive forms and cultivars of brachyscomes. It also details the habit, propagation and cultivation requirements of each species and features over 100 precise and beautifully executed line drawings by botanical artist Gloria Thomlinson. Australian Daisies for Gardens and Floral Art, published by Lothian in 1987 for ANPSA's Australian Daisy Study Group. It describes and illustrates over 150 plants, with notes on their flowering periods, propagation, cultivation, uses and habitat. Australia's Eremophilas: Changing Gardens for a Changing Climate by Norma Boschen, Maree Goods and Russell Wait (2008). Further details and a review are available here. Australian Indigenous Orchids by A W Dockrill (1969); 2 Volumes describing Australia's terrestrial and epiphytic orchids. Australian Plant Genera - an etymological dictionary of Australian plant genera by James A. Baines, published by SGAP in May 1981. Australian Plants for Canberra Region Gardens and other Cool Climate Areas (2015); published by the Australian Native Plants Society - Canberra. Further details here. The Banksia Book by Alex George (1984, 1987); every species illustrated in colour and described in detail. Banksias - A Field and Garden Guide by Ivan Holliday and Geoff Watton (2009). This is a revised edition of A Field Guide to Banksias, first published by Rigby Ltd. in 1975. Coastal Plants of the Royal National Park, a CD published by the Sutherland Group of the Australian Plants Society (NSW). Further details here. The Cradle of Incense by George Althofer (1978); seeking out and cultivating Prostanthera species. The Dryandras by Tony Cavanagh and Margaret Pieroni (2006); the definitive work on this spectacular member of the Protea family (2006). Further details and a review are available here. Everlasting Daisies of Australia. Published by C.H. Jerram & Associates for the Australian Daisy Study Group. The book, which was published in June 2002, has chapters on growing, propagation, floral arrangements, floriculture, reproduction and hybridization. Detailed species' descriptions are written in easy-to-understand language and illustrated with beautiful colour photographs. For each individual species there are sections on flowering period, propagation, cultivation and uses, distribution and habitat, and similar species. Friends and Foes in Australian Gardens by David Hockings (1980); a comprehensive guide to pest and disease control. The Grevillea Book Vols 1, 2, and 3 by Peter Olde and Neil Marriott (1994 - 1995); the definitive work on this third largest of the Australian genera. 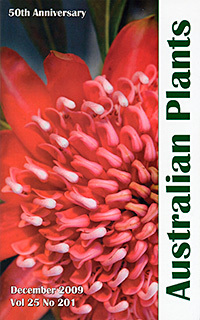 Growing Australian, a CD published by the Australian Plants Society (Victoria). This is a resource kit for home gardens, particularly in Victoria, and is available both as a CD or as a CD and loose-leaf binder. Further details here. Growing Native Plants on the North Coast of NSW (2009), published by the Coffs Harbour Group of the Australian Plants Society (NSW). Further details here. The Language of Botany by C N Debenham (1971); a comprehensive dictionary of botanical terms, with illustrations. Mangroves to Mountains: a field guide to the native plants of South-Eastern Queensland (2014). This is a completely revised and updated publication of the two books published in 2002 and 2005 by the Logan River branch of the Society for Growing Australian Plants (Queensland). Further details here. Native Plants of the Sydney District: An Identification Guide by Alan Fairley and Philip Moore; photographs and descriptions of the flora of the central New South Wales coast and hinterland (1989; reprinted with additions and corrections 2002). Also published electronically. Native Plants and Bushwalks of the NSW Central Coast, a CD published by the Central Coast Group of the Australian Plants Society (NSW). Further details here. SGAP: The Story of Arthur Swaby and the Society for Growing Australian Plants by John Walter (2007); a compehensive look at the Society's history and Arthur Swaby's role in its foundation as well as the story of the pioneer growers of Australian native plants in the period before the Society was formed. Complementing Australian Plants is the Society's online magazine called (appropriately enough!) "Australian Plants online" - APOL for short. - which features a range of articles and book reviews covering all aspects of growing, propagating and appreciating Australian native plants. Although APOL is no longer being published, the articles (which number into the hundreds!) are still available to read or download. The articles can be viewed here. The various Regional, District and Study Groups also issue regular newsletters which advise members of coming events as well as publishing articles and letters contributed by members. Newsletters are generally available only to members of those particular groups but some Study Group newsletters can be down loaded from our Downloads page. ANPSA's blog, 'Gumnuts', went into recess in October 2009 but past issues are still available for viewing via the Australian National Library's Pandora Web Archive. Back issues of the 'Gumnuts' email newsletter (which preceded the blog) are also available for viewing. These can be accessed through our Downloads page.